For my daughter's 2nd birthday party, I decided to have a Pancakes and Pajamas party. I got the idea from a friend on facebook who did the same thing for her son, and I thought it was a great idea. 1) She loves pancakes! And by love, I mean the first thing she does every morning is get out the syrup out of the pantry and say "Pancakes!" 3) It's a relatively cheap party idea. You can feed a lot of people on pancakes and other breakfast items without spending a portion of your kid's college fund. 4) Any occasion to serve coffee and mimosas is always very much appreciated by adults. The following 2 pics were taken by my friend, and professional photog, Brooke Logue. You must check out her blog and see her work and if you need a Palm Beach area photographer, she's the best! How lucky am I that she took some pics and put together this beautiful collage which captured the party perfectly. My favorite way to do invitations is to buy a digital print from Etsy. There are many sellers on Etsy that provide personalized invitations. You send them wording and a picture, and they send you a digital file that you can then upload to your photo provider. I use Costco to print invitations. They are even cheaper than Walmart at $.39 each for 5x7 prints and $.13 each for 4x6 prints. 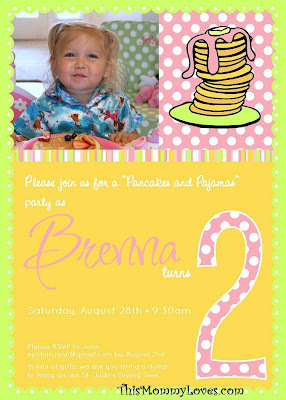 Our Pancakes and Pajamas Invitation was created by Dimpleprints. Carli created a custom invitation for me. I just told her colors and concept, and she came back with this adorable creation. Since it was a Pajama Party, Brenna needed a cute new pair of Pajamas and again, Etsy was the place to go. I gave the Alchemy section of Etsy a try. Alchemy is a space on Etsy where buyers can post requests for custom items. Sellers then bid on the opportunity to make the item and win the sale. I posted that I wanted a custom made pair of drawstring toddler pants for my daughter and I'd pay $15. I said I'd pay $25 for a top and bottoms. Within 30 minutes, I had 12 bids. 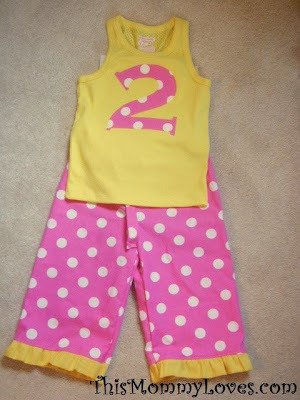 Max and Meena actually came in under my bid price and created this adorable PJ outfit. 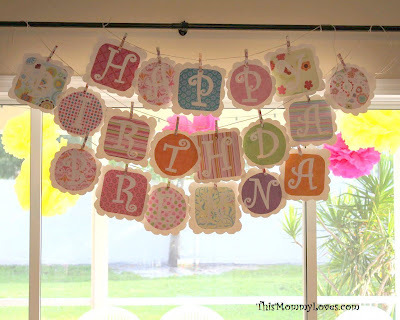 Birthday Banner. Check out my Tutorial Here for exactly HOW TO and a FREE Printable! The Handy Husband custom built this toddler size picnic table so that all the kiddos could sit together. We had 10 kids on each side and lining the benches are kids' aprons which were purchased at the dollar store and served as our party favors. Table Measurement: Benches, 9.5 inches from the ground. Table, 18.5 inches from the ground. 10 feet long. Full tutorial coming soon. The Giving Tree is my favorite birthday tradition which we started at Brenna's 1st Birthday Party. I stole this idea from one of my Mommy Squaders, Allison. 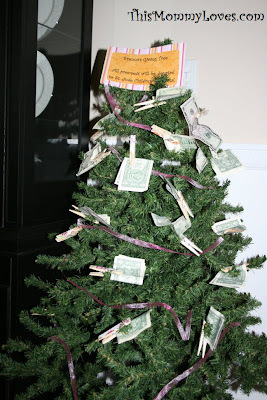 On the invitation, we requested "In leiu of gifts, please bring a dollar or 2 to hang on our Giving Tree. All proceeds will be donated to St. Jude Children's Hospital." We then set up a small artificial Christmas tree, wrapped ribbon around and clipped some decorative closespins (Click Here for Tutorial.) to the ribbon for guests to use to clip their money. Our thank you notes will include a message about our donation total. The kids had fun popping in and out of our plate. Here's me with the birthday girl. 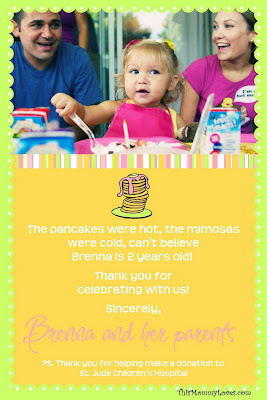 Brenna loved her Pancakes and Pajamas party! I hope you did too! 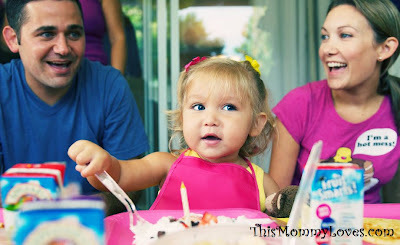 Have you hosted or attended any cute kids' parties lately? Tell me all about it by leaving a comment below! Thank you to those beautiful blogs who have featured my party! Ya'll, this post was featured on freakin' Tatertos and Jello! Um, yes, THE Tatortots and Jello!!! Thanks for the love, bloggers! I love this party idea and really great decorations! I may have to steal some of your ideas:) I love learning new ideas to do! You already know I just love that idea! Cute blog Jenn! I'll check back often! a beautiful party for a beautiful little girl! What a cool party. I could see this for a big girl slumber party, too. Love the banner!! Very cute. Awesome ideas! my son is turning 2 in just a few weeks - I am totally using some of your ideas! We're having an evening party, so no pancakes this year, but I love the Happy Birthday sign and the Giving Tree! I wanted to have guests contribute to the Free Wheelchair Mission in lieu of gifts - this tree is a fantastic idea! oh my goodness, that whole thing is fantastic. i didn't think it could get any better, but then you whipped out that bacon and egg face thing, and now i know you're a total genius! i will be telling my sister in law about this for her childs 3rd birthday. I want MY kids to throw ME a PJ and Pancakes party! Isn't that just the best?!?! Lucky girl to have such a talented mommy! This is one of the cutest birthday ideas Ive seen. Perfect for a toddler, but heck even for older kids. My kids love pancakes too. Everything turned out so cute, and the aprons, and the giving tree. Pretty please come over and share this with my readers, I love it, and they would too. Glad I found you!!! This is so cute- what a great idea! I am forwarding this link to my daughter. She has a 2 year old and 7 month old twins - lots of birthday parties to plan. I am your new follower - I don't want to miss those tutorials! what a great party, lots of fun! What a wonderful party, loved the photo's! This is the CUTEST idea for a party! You really created a wonderful day for your daughter! That is one terrific idea and party! Love all the extra touches you added! I'm going to keep that one in mind if I ever have grandchildren! So adorable! What great ideas you've shared! I will definitely have to remember the digital prints from Etsy and the Alchemy part of Etsy! My daughter's seventh birthday was this past weekend. Her tea party was my Tablescape Thursday entry. I managed to postpone the request for a slumber party to next year, so I will have to save some of your ideas for next year! 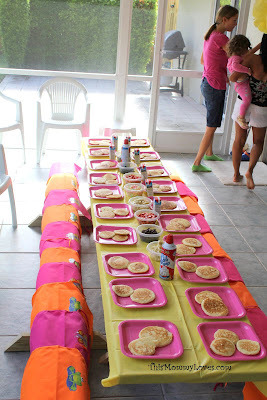 Cute idea...love the pink and orange table...that is a lot of pancakes! Looks like the PERFECT party! Absolutely fabulous! Awesome idea!! I really love the Giving Tree idea. Thanks for linking up to What the Cr@ft!?! Congratulations Jenn, your cute party made this week's Top 5 Hits! Come check it out, grab a button if you'd like and thanks for sharing such a great idea with us! This is just wonderful! I love each and every detail! The table idea is genius. I am way past this stage but will store this away in case I ever have any grandchildren. I love the idea of the giving tree too. What a wonderful tradition. aaawww.. thats the most gorgeous party.. and theme.. I've ever seen!! aaawwww!! Happy Birthday to your little one..
Tears are seriously flowing as I read this! My three year old son is a cancer patient at Arkansas childrens hospital and St Jude! What a wonderful idea. He just finished 20 round of chemo and his 4th bday is coming up. I think this would be a wonderful party for him! Thank you so much for posting these adorable ideas and even more for giving to a place that (along with God's help) is healing my son! What an awesome idea for a birthday party! I love the bacon and eggs cute out too! Too cute I love it! What a fun idea. My favorite part: the eggs and bacon plate! Adorable party and birthday gir Ü sooo many great ideas especially the giving tree. I love this party!! Too cute and original! May I repost on my blog? Love it! We always asks friends to bring something for St. Jude at birthday time. They're wonderful to send a list of things their patients are in need/want of. This year, my 4 year old had a pajama party, so each guest brought a pair of pajamas to send to St. Jude. Most ended up bringing 2 pairs, so we sent a huge box over! What fun. For my son's birthday, I think I'm going to ask friends to bring gift cards for I-tunes (seems to be a big one for the teens and tweens at St. Jude). Moms have said that their kids LOVE picking things out for the patients. We are lucky to have happy healthy kids (with way too many toys) and we love to box up things to send on! It's a great way to help and remind our kids what's important in this world. THe party is VERY cute! 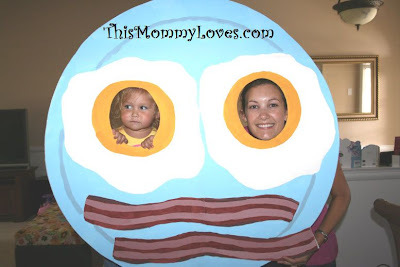 And the bacon and eggs photo prop is hilarious!! What an awesome party! Where did you find the pink trays? I must get some! Lori, we will think of your family each year when we set up our Giving Tree. Laura, that's a great idea about the PJ donation! I love the party idea! So cute! For some reason I started thinking about my little one's 2nd bday party today (6 months away!). 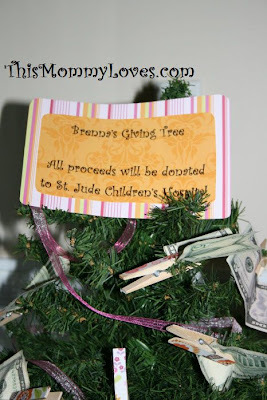 I love the giving tree idea--I was talking to some friends and mentioned asking guests to buy gifts to be donated to a local charity or childrens hospital (instead of for my little one) and the people I was talking to thought I was crazy! Nice to see other people think of others too! That is the cutest Birthday idea! And I love The Giving Tree idea! 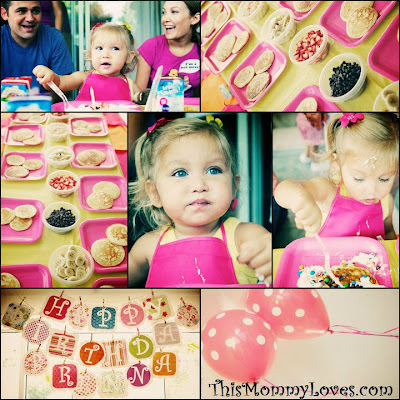 Cute birthday party idea !!! Can you tell us a little more about the plate of egss and bacon ? How big is it? What did you make it out of ? i love that idea and you are so creative as well. Holy moley! This is one of THE cutest ideas I have run across and that St. Jude Christmas tree is AWESOME!! Totally awesome, awesome, awesome!! I am absolutely using this idea :) Thank you to you (and your friend!). I was actually training for my first St. Jude marathon in Memphis, TN in December when I was hit by a car on 9/17. This charity is so dear to my heart. Sooooo glad I ran across your blog as I surf the 'net while recovering ;) I'll absolutely be back! Your daughter is adorable. What fun party ideas and so bright and cheery! I love it! oh my goodness! this is the cutest idea i have seen in a long time!!! Loved the idea sooo much,I am doing it for my daughters 5th birthday!!! Can you please tell me how your husband did the peep through plate!! FABULOUS! I would love to make one as well!!! I just ran across your blog today when I was looking for ideas for my son's 2nd birthday - he is absolutely obsessed with pancakes, and we will definitely be using some of your ideas! Thank you! Hi, I didn't have time to read all of the comments so I am not sure if you have answered this already, but could you let me know how you go about giving a donation to St.Jude? My husband and I would love to do that instead of people bringing gifts as our daughter's birthday is 6 days from Christmas. She will get enough gifts then, and a few from us on her birthday, but we would love for everyone else to donate money to St. Jude instead. I love birthdays oh so very much....that being said, every year since I was 13, I've had a party on my birthday which last the whole week of my birthday because I could never get anyone organized for my actual birthday or it fell on a school day or something. It makes my birthday week pretty awesome. Recently found your blog and love the kid's sized picnic table. Do you have a tutorial on how your husband did this? We are looking to do something just like it for our son's birthday! How can I order these exact same pajamas?? They are so cute!! beautiful. this is looking like one of the best parties of kids. Wow - this adorable! Thinking about doing this for my soon-to-be 6 year old and you had so many awesome ideas. Thanks for the inspiration!! Jenn, I am doing the pjs and pancakes theme for my daughter's party this weekend. I found your stuff and used Carli for my invitations. I've had several parents ask about wearing their pjs. Did you have parents ask this, and how did you handle it?